the entire city of venice! j/k that’s a lot, but really take the time to explore abbot kinney; there are so many local boutiques and eats along this classic cali street. it was april 2012, and with my sister in tow we made the drive up from the oc to venice for a day of exploration. i was smack dab in the middle of my restless (and uninspired) working from home period, and as fate would have it had the epiphany i didn’t know i was looking for on this day. intelligentsia is the first coffee shop i posted on the @escapeyourdesk instagram account and was the catalyst to this passion project. while i didn’t post the photo to instagram until 2014, it was on this fateful day that a new way of life and being was born, and the escape your desk mantra came to life. with luck on our side, we find a free parking spot a block away from abbot kinney (if you know la you know this is major!). we make our way up california st and make a quick right onto the famed abbot kinney. 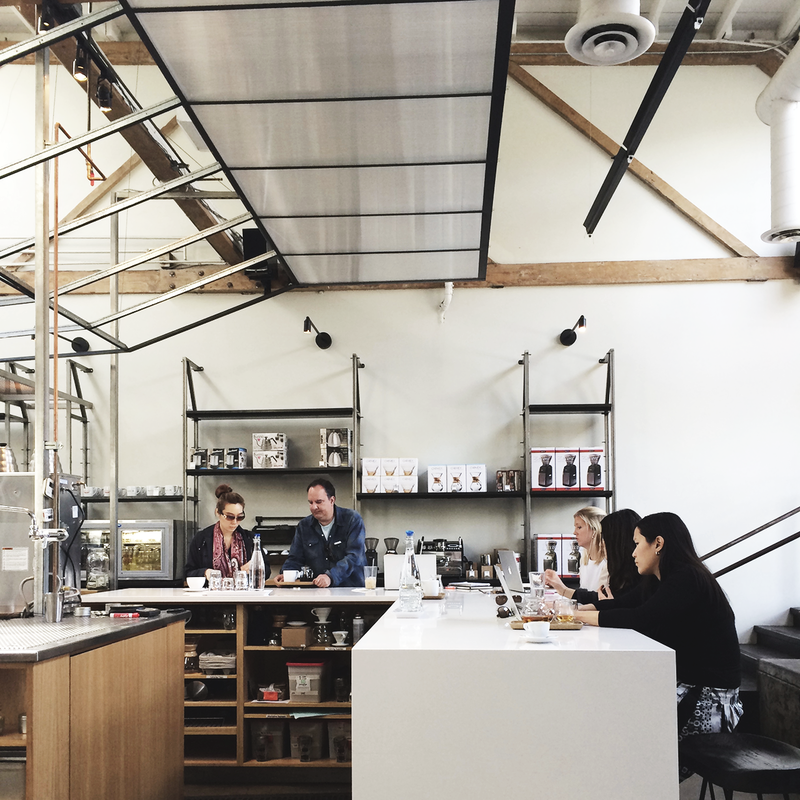 of course the first thing i spot is the shiny intelligentsia emblem i’d bookmarked on yelp eons ago. i can’t believe we’re finally here (eeek!). i start to pick up the pace; we stop at the entrance and my heart can’t help but skip a million beats. we make our way through the gates and are entranced by what could arguably be the epicenter of california coolness. the walkway is everything; it’s lined with lush greenery and a wall of chic, but ever so industrial-esque wooden bleachers. only adding to the space’s vibe is the fact that its seats are filled to the brim with angelenos who embody the elevated surfer chic look to a t: slim fitting sweats, texturized hair and the perfect messy tuck of an alexander wang tee. we get in line (which is of course out the front door) and i feel a whole another rush of dopamine hit as i fixate on the details inside of this shop. the meticulous design makes it all feel so effortlessly intentional: glass mini coffee carafes, wooden trays, and of course, white ceramic mugs with the classic intelligentsia red ring bottom. nothing is overlooked, and i quickly decide that i want to mirror my life after this type of effortlessly intentional vibe. as we approach the front of the line i glimpse at the menu and look up. and, just wow. the skylight is letting some of the most beautiful sunlight i’ve ever seen into this lofted open space. a perfect mix of grand and delicate touches engulf you as you enter the shop, and its quite clear the shop’s creators thoughtfully designed its layout to present the layers of experiences they hope to create for their customers. i place my order and the line breaks; i’m guided along one side of the counter to watch my barista prepare my iced latte – i love that you become a part of the process. the seating is just as curated as the ordering experience, and i realize this space is perfect for it all: meeting friends, coming to work or picking up a quick cup of coffee. as i walk out the front gates, i know i’m home. and my friends, this is where the constant chase for daily escapes all started. 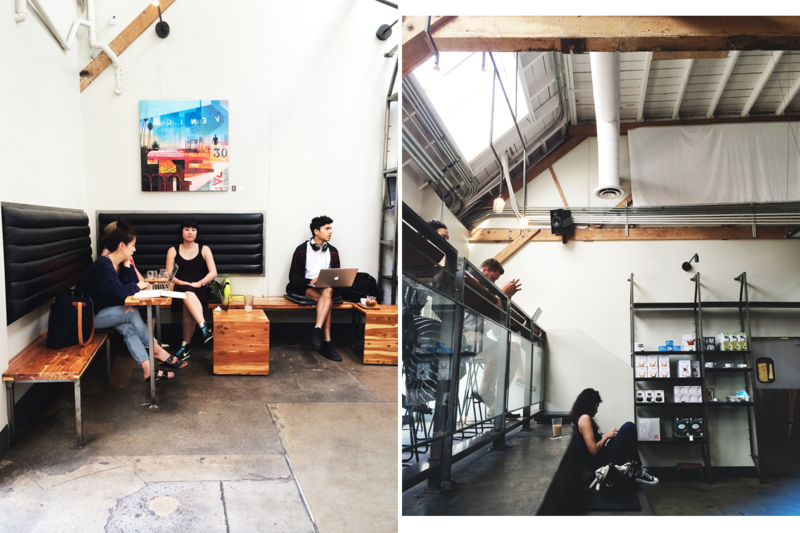 intelligentsia executed this vision and was one of the very first to truly craft a creative and carefully curated coffee shop. from the moment you place your order, you become a part of the experience. 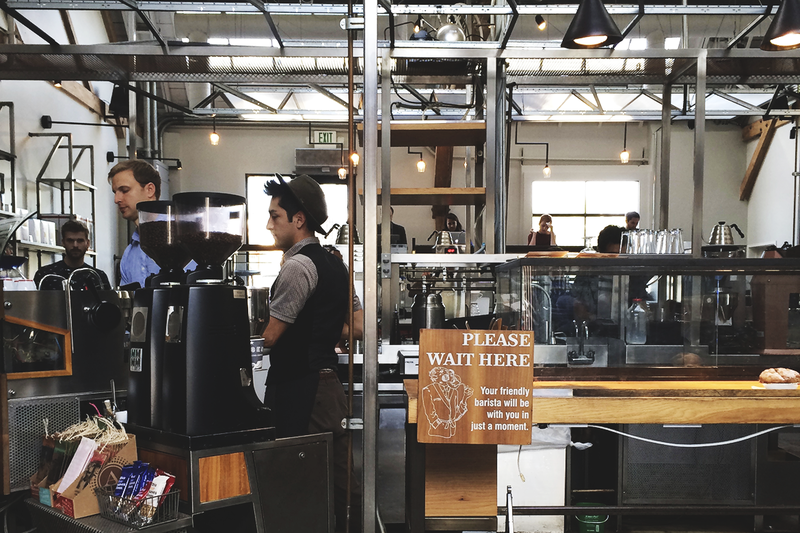 being able to watch your barista carefully prepare your drink whilst you wait, without crowding around you, is unique to this location. the space was designed to move traffic along both sides of the bar, and it’s good use of space makes it easy to spread out throughout the shop with your beverage. this place gets crazy packed on the weekends, but weekdays in the late afternoon are a great time to come in if you’re looking to get some work done. there’s an entrance in the back of the shop, so you’re able to make a clean entrance and exit to and from your parking spot. free parking along the street behind the shop. come for the coffee, but stay for the ambiance. trust, this place is worth fighting the crowds for.